This little one has been so happy going back to School in fact he actually looks forward it. We had a little bedtime conversation the other night about how he doesn't get to play as much now that he is in Year One but that's okay because he likes doing work. Let's hope he continues to enjoy it. This will be our view today as we head to Llangollen for their Santa Train Special. This visit has been a tradition in our family for about 14 years now with big J visiting every Christmas with his Grandma and Grandad. It's only been in the last few years that we have joined in too as the family has grown and now there are 14 of us that enjoy this special trip to see Santa. Yesterday we had our first Santa visit of the year. We visited him at Dobbies Garden Centre and it was one of the most magical experiences we have ever done. Little J absolutely loved it and it has definitely put us in the Christmas mood. What a great way to start the month! First week back at school and little J has already been to a party. This week he celebrated one of his friend's 6th birthday. It's strange that some of his friends are already 6 or will be soon when little J was only 5 a few months ago. 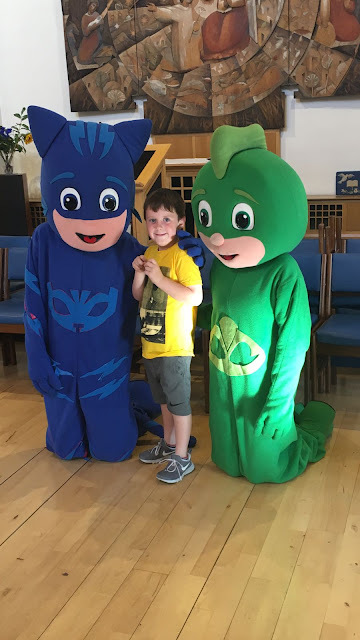 Here he is with PJ Masks Catboy and Gecko. On the eve of back to school week this photo, this memory, our holiday seems like a million years ago however it was only two weeks. We can't complain because we have had a fun filled Summer doing lots of amazing things and meeting lots of new people. I am sad it's over but I have our fabulous photos to remind us of all the good times we had. January is my least favourite month because nothing good happens in January. Christmas has been and gone, you usually feel the need to diet after over indulging at Christmas and money is tight due to over spending. 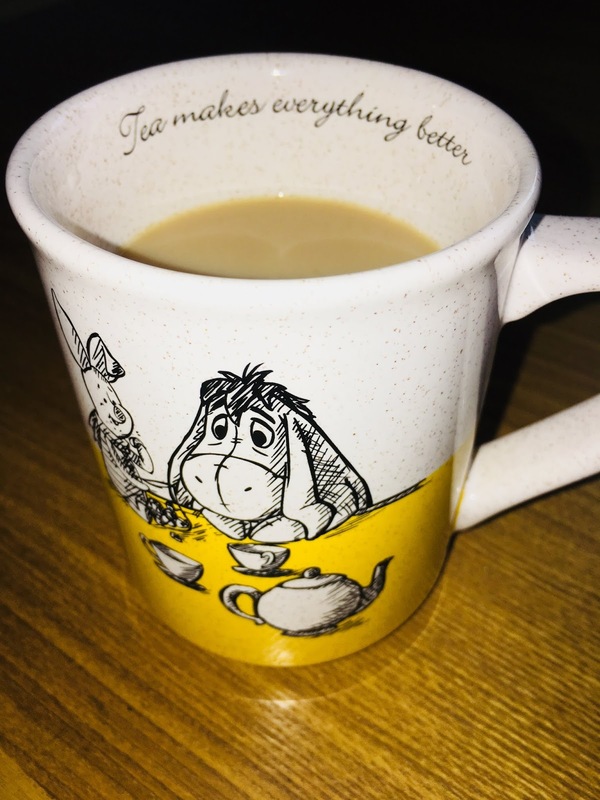 This month we definitely need to tighten our purse strings so we have been opting for winter walks and staying away from January sales. To be honest the last two weekends have been lovely we visited Tatton Park last week, and today we fed the ducks and little J rode his scooter around the park. Days like today don't cost anything but are so much fun. It's nice to cut back every now and then and it's good to remember that most children just need a large open space to run around in with their ball, bike or scooter and days like that usually come free. Happy New Year Everyone. I hope you all had a fantastic Christmas and New Year. A week ago our fireplace was covered in tinsel, twinkling lights, candles and lots of other festive decorations but now it is so bare and I don't like it. If I am honest I was desperate for the decorations to come down as after the toy explosion that was Christmas the house felt cluttered and dusty and in need of a big clean but now it just looks so miserable. Yesterday we spent the day at Alton Towers for their annual Scarefest event. We have been going every year for as long as I can remember. It's such a great day and it's the first time all season you can experience the rides in the dark. I will pop a full post on soon about all the scary things you can get up to but for now here's our Sunday photo. Last night we headed up to Blackpool to see the Blackpool lights. It's something we do every year but usually we have our winter coats on, hats, scarves, gloves etc but yesterday we just had our rain macs on. It wasn't very cold yesterday so it didn't really feel right seeing the lights on a warm day. We are so used to walking round Blackpool with the cold wind on our face. We might have to take another trip up before they finish. Anyone else been to see the lights yet? Highlight of the week was booking The Overtones at Christmas. Absolutely love The Overtone so roll on December. 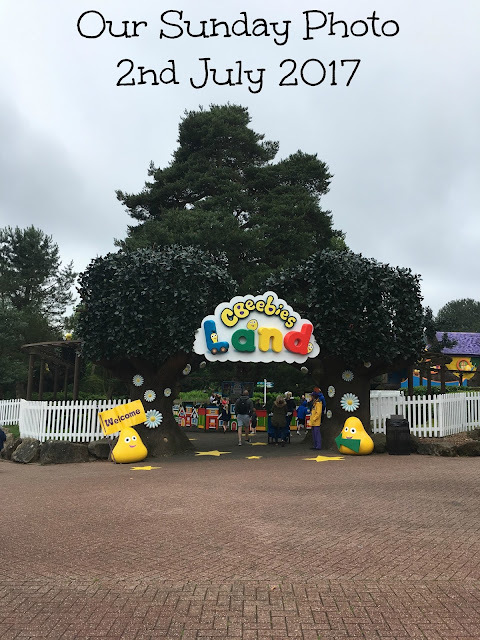 This weekend little J and I headed to CBeebies Land at Alton Towers for a fun packed day. Keep a look out for what we got up to very soon. I don't think little J fully understood when I said I was just popping out for some essential shopping.